Posted August 30th, 2011 by blueprairie & filed under Field Trip. Field Trip! 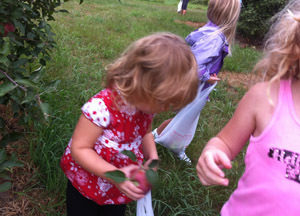 Late last week we planned an early morning field trip with a friend to a nearby apple orchard. We woke up to stormy looking clouds, but we took the gamble and went out anyway. We did get a little wet at the end, but so glad we went anyway. 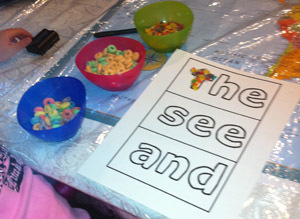 When we got home we had a snack/sight word lesson (from Moffatt Girls). I put cereal in bowls and asked the girls to fill in the letters with the cereal. I didn’t get any after shots, but this is how they looked starting out. E4 did it pretty well. K3 just ate the cereal. Later in the day we did a circle time and updated our calendar, practiced our Bible verse of the week, Phillipians 4: 13 (I can do all things through Christ who strengthens me) and a FIAR art activity (colored a picture of the Yantgze River with colored pencils) but I didn’t take any pictures. We also did a round on the merry-go-round with our Sing Spell Read and Write curriculum. All our previous lessons with this have been a breeze, this one, is gonna take some time. But we practiced blending B with the vowels. We all then played a card game called Snap and I considered this our Math lesson as is was time to start dinner. And that’s what we did today!